John Paull has just published a short biography of Lord Northbourne (1896-1982) in the Journal of Organic Systems, “Lord Northbourne, the man who invented organic farming, a biography,” Journal of Organic Systems 9 (1), 2014, pp. 31-53. 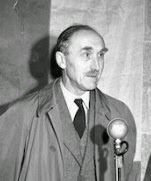 Northbourne is generally known to those with an interest in Traditionalism as the first English translator of René Guénon’s The Reign of Quantity (1953), of Frithjof Schuon’s Light on the Ancient Worlds (1965) and of Titus Burckhardt’s Sacred Art in East and West (1967). John Paull’s article argues convincingly that Northbourne’s 1940 book Look to the Land invented the term “organic farming,” which Northbourne put in opposition to “chemical farming.” He did not actually invent organic farming, however, but rather repackaged ideas deriving ultimately from Rudolf Steiner and Koberwitz via Ehrenfried Pfeiffer’s Bio-Dynamic Farming and Gardening; the term was then picked up and popularized by Jerome Rodale with his periodical Organic Farming and Gardening. According to Paull, it was after the publication of Look to the Land that Marco Pallis got in touch with Northbourne and introduced him to Traditionalism. This led to Northbourne’s Religion in the Modern World (1963), to a number of articles in the Maryami-aligned journal Studies in Comparative Religion between 1967 and 1974, and to a final book, Looking Back on Progress (1970). It seems that it was Northbourne who introduced E. F. Schumacher to Traditionalism: Schumacher and Northbourne were both active in the Soil Association, which promoted organic farming. Northbourne may thus be important for the environmentalism of Seyyed Hossein Nasr and Prince Charles. Northbourne was the fourth baron, descended from the first baron, a friend and colleague of Prime Minister William Gladstone. He was educated at Eton and Oxford, where he was president of the Oxford University Boat Club and for some time lectured on agriculture before succeeding to the family estates in Kent, where he lived for the remainder of his life.